Vice President M Venkaiah Naidu has exhorted Indian business houses and prominent entrepreneurs to come forward and set up quality institutions in higher education so as to ensure a paradigm shift in promoting research and innovation in Indian universities and colleges. Vice President Naidu was speaking on the occasion of a book launching function organized at his resident by the Education Promotion Society for India (EPSI), BIMTECH and Bloomsbury Pvt Ltd. 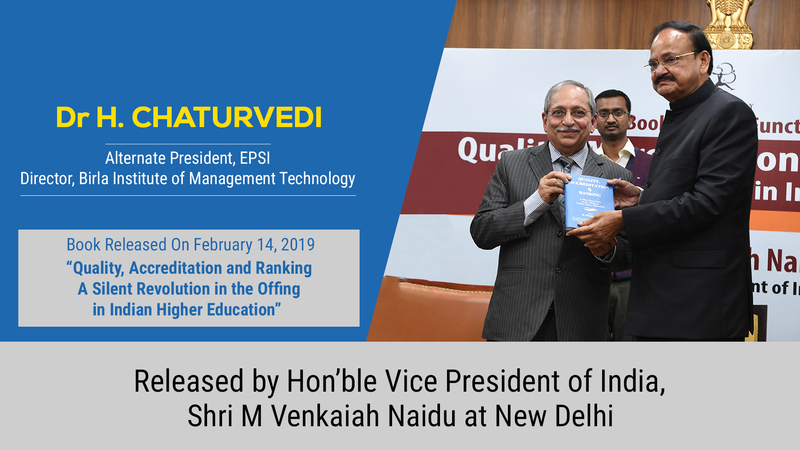 The book titled “Quality, Accreditation and Ranking – A Silent Revolution in the Offing in Indian Higher Education” edited by EPSI’s Alternate President, Dr H Chaturvedi was released by the Hon’ble Vice President Naidu. On this occasion, the UGC Chairman, Dr DP Singh and Management Guru Padma Shri Dr Pritam Singh were present as the Guest-of-Honour. Check out the video excerpt of the book. Dr H Chaturvedi is Professor and Director at Birla Institute of Management Technology, Greater Noida, India. He has more than 42 years of experience in teaching, research and academic administration. He has been Director at All India Council for Technical Education (AICTE), a statutory body under MHRD, Government of India. Being a renowned management educationist, he has been deeply involved with national bodies like AIMA, NHRDN, AIMS and the Indian Management Conclave (IMC), organized by the MBA Universe.com. Dr Chaturvedi is a Member of Board of Governors, Indian Institute of Tourism & Travel Management (IITTM), Gwalior (under the Ministry of Tourism, Government of India, Special Invitee Member, Board of Governor, United Nations Global Compact Network India, New Delhi, Member, Advisory Board, Asia Pacific Centre for CSR Sustainability, UNGCNI, New Delhi, Member, Board of Governor, Birla Global University, Bhubaneswar, Member, Board of Management, Birla Global University, Bhubaneswar. Dr Chaturvedi is the Trustee and the Executive President of the Education Promotion Society for India (EPSI), Academic Council Member, Manav Rachna University, Faridabad and also the Founder President of the Alumni Association of Agra University (AAAU), BIMTECH Foundation and Ranganathan Society for Social Welfare and Library Development (RSSWLD), Uttar Pradesh. He is also Main Trustee of the Atal Incubation Centre BIMTECH. Dr Chaturvedi has authored and edited five books relating to various challenges before Indian Business and economy and his latest book is titled “Transforming Indian Higher Education”. It provides a highly conducive academic environment, interaction with hard working and industry-academia mix professors, proximity to the strategy makers of the industry and practitioners of the service and manufacturing companies, exposure to the international universities and companies. Birla Institute of Management Technology was established in 1988 under the aegis of the Birla Academy of Art and Culture, and supported by Birla group of companies. Late Dr. (Smt.) Sarala Birla and Syt. B K Birla, chairperson of B K Birla Group of companies are the founders of the business school. BIMTECH is mini India in its formation every year. It has students coming almost from all the states of India, and also from few foreign countries. BIMTECH is like a school where international business endeavors are also made. Its mix of nationalities, cultural backgrounds, academic and professional experiences make BIMTECH one of the most exciting and enriching business schools in the country. Why is Email Marketing Important For Universities?